David Owen said he has never smoked marijuana in his life, and he doesn’t plan to if North Dakotans approve a measure calling for the legalization of it. So why would the University of North Dakota student studying molecular, cellular and developmental biology and political science spearhead the effort to decriminalize the drug? He pointed to stories of residents who had dreams of aspiration -- both large and small -- only to have the chances of achieving those dreams quashed by possessing or consuming a drug that he said shouldn’t be illegal. “(One person) has a paraphernalia charge and he can’t get work at Simplot. They will not consider him,” he said. He pointed to another man who can’t move up to management in his career as a firefighter because of a misdemeanor possession charge. “You just hear this story over and over again,” he said. Owen, the chair of Legalize ND, drafted Measure 3, a referendum that would allow anyone who is at least 21 years old to sell, possess and consume the drug in North Dakota. It also would expunge records for for those with marijuana-related convictions. The measure has gained both support and opposition and is arguably the most talked-about referendum on the November ballot. 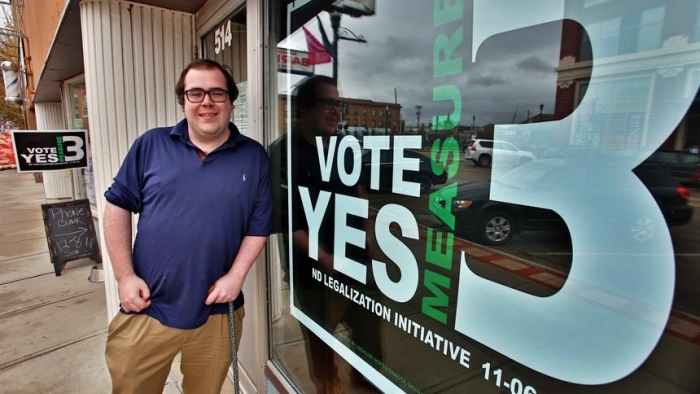 The effort to legalize marijuana in North Dakota has been a part of Owen’s life for four years. Owen has spent the last several months traveling around the state on behalf of the measure. He goes back and forth from Grand Forks to Fargo, where the Legalize ND headquarters is located, on a regular basis. Some have called Owen a champion of the cause, he said, and others have spread rumors, thrown insults and even threatened Legalize ND. “You hear a lot of nasty things from people. You just have to get over it,” he said. ‘How hard is being a chair?’ Owen has lived in North Dakota for six years, but his family roots are planted in the region. His grandfather grew up in Hillsboro, N.D., and his grandmother was raised in Climax, Minn.
His grandfather got a degree in aerospace engineering, prompting him to move his family to Maryland for a job with NASA. “I don’t know if you noticed, but there aren’t many space rockets in North Dakota,” he said. Owen, 25, was born in Maryland, but his family returned to Minnesota for vacation often. He now studies molecular, cellular and developmental biology, as well as political science. He is looking into a master’s degree in public administration. He dated his involvement with Measure 3 to when he was 18 years old. He said a friend who wanted to be in the military was at a party that was busted. Officers found marijuana at the party, so everyone was charged, he said. He said he forgot about the incident until he started to see UND students being arrested on marijuana charges. He recalled one person who was given a felony charge for having marijuana within a school zone -- because he lived on UND’s campus. The person pleaded down but lost his student loans and couldn’t continue school. “Last I heard from him, he was basically a laborer somewhere in town,” he said. He decided to join the efforts to support a recreational marijuana measure in 2016 under the leadership of Eric Olson, but the referendum didn’t gain enough signatures to get on the ballot. Polls have been mixed on the measure. One poll published in August by Odney, a North Dakota advertising and public relations firm, said 38 percent of the participants supported the measure. A more recent poll conducted earlier this month on Legalize ND’s behalf stated 51 percent of participants supported the measure and 36 percent were opposed. Along with support, Measure 3 has garnered criticism. The measure is poorly written and would cause problems for the state, the Legislature and people of North Dakota, said Robert Wefald, chairman of North Dakotans Against the Legalization of Recreation. “My job is to make sure that fails, and I think we are going to be successful at that,” Wefald said. Wefald said he didn’t know Owen before the rise of recreational marijuana referendum, but he commended Owen, saying he has worked very hard to draft the measure and promote it. “I think he is a bright and capable young man,” Wefald said. “He is a smooth-talking salesman.” Anyone can say a measure is poorly written if they don’t like it, Owen said. “The way I put it is, the Lord our Father himself could come down and write a bill, and the lawyers would look at it and say, ‘It is a little poorly written,’” he said. Owen said he is feeling good about the chances of the measure passing. But his work won’t be done if it passes, he said. “I have to go and make sure in Bismarck that they don’t do medical (marijuana) 2.0,” he said, referring to the extended length of time it took to implement medical marijuana after North Dakotans approved it in 2016.